Be a part of the #RIPLeffect: Come to our PLA preconference! Did you miss out on the inaugural Research Institute for Public Libraries (RIPL) this past summer? Well, now’s your chance to be a part of the #RIPLeffect. RIPL instructors will be offering a full day preconference at PLA 2016 in Denver: Think, Do, Show: Practical Techniques for Analyzing, Using, and Visualizing Data to Improve Practice and Demonstrate Impact. This preconference will take place on Tuesday, April 5, 9:00 AM-5:00 PM. The curriculum is straight from RIPL 2015, refined and improved based on participant feedback! Libraries collect a lot of data: circulation, program attendance, user satisfaction, etc. In this preconference, you will learn how to go beyond simply collecting and reporting on these numbers. Through a series of interactive exercises, you will discover how to analyze your data, use your results to inform your strategic planning, management, and communication with stakeholders, and visually present your statistics in infographics and other formats to demonstrate your library’s impact. To participate fully in the preconference, you will want to bring a laptop with Excel. Want to sign up? 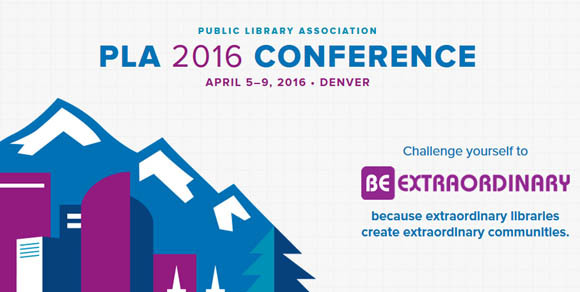 PLA 2016 registration opens today (September 15, 2015) at 12:00 PM CDT. Simply select this preconference as part of the registration process. Hurry! Space is limited. Interested in getting updates about future RIPL events – including a second RIPL that will be offered in 2016, as well as RIPL curriculum offerings at conferences, webinars, etc.? Go to the RIPL website and sign up for email updates in the “Overview” section.